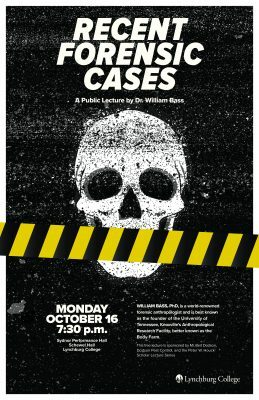 Dr. William Bass, world-renowned forensic anthropologist and founder of the University of Tennessee’s Anthropological Research Facility known as the “Body Farm,” will speak at University of Lynchburg at 7:30 p.m. Monday, October 16. The free lecture, which is open to the public, will be held at Sydnor Performance Hall in Schewel Hall. Bass will discuss recent high-profile forensics cases. Earlier this year, Bass partnered with University of Lynchburg when he toured Historic Sandusky, a historic home that the College operates in partnership with the Historic Sandusky Foundation. After learning about students’ involvement in archaeological and historical research at Sandusky, Bass donated an ancestor’s Civil War diary to University of Lynchburg and Historic Sandusky for study and preservation. In addition to his public lecture, Bass will visit University of Lynchburg classes to speak with students and faculty about his experiences. The lecture is sponsored by Dodson Pest Control and the Peter W. Houck Scholar Lecture Fund.